Whether its drool, spit-up, urine, or whatever, cribs can become soiled very quickly. Lullaby Earth crib mattresses are completely waterproof, even on the edges where most crib mattresses have seams. Just wipe up any mess with regular soap and water and you are good to go! The Lullaby Earth crib mattress is designed to fit snugly in your babys crib, conforming to ASTM standards for crib mattress dimensions. For safety, you should be able to fit no more than two fingers between the mattress and the crib. Square corners help eliminate any gaps within the corners for a safer, tighter fit. 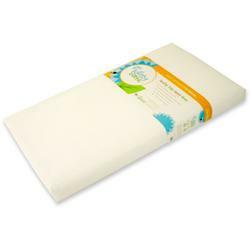 Measures 27.5" x 52" x 6"
Lullaby Earth crib mattresses are primarily made from two materials that are among the most common materials recycled today. These materials are also used throughout the food packaging industry for their purity and recyclability. NO polyurethane or Vinyl/PVC! Recycling Programs: At Lullaby Earth we use materials that are commonly recyclable. However, recycling programs have not yet been established for products of this shape and size. We anticipate that as more products are made with recyclable materials, recycling programs will follow. By creating this mattress we are proud to be leading the way toward this goal. Even in very small amounts, chemicals can have a negative effect on a babys development. The Lullaby Earth baby crib mattress was designed to be free from harmful chemicals and allergens. Unlike most crib mattresses, Lullaby Earth mattresses are completely free of polyurethane foam (including "soybean" foam blends), vinyl/PVC, polyurethane coated nylon or damask, PFC water-resistant treatments, antibacterial biocides and the various chemicals associated with these materials. Fire protection is achieved with hydrated silica, a harmless natural mineral. Lullaby Earth is a Healthy Child Healthy World partner and recommended manufacturer. Lullaby Earth offers superior products that meet the HCHW Quality Standards in the childrens mattress and bedding category. The Lullaby Earth crib mattress is made right here in the U.S.A. (including all components of the mattress). As such, we are proud to stand behind it with a "no hassle" lifetime limited warranty.